Two Americans have been arrested for allegedly sharing their house in Asturias, Cebu, with 14-year-old twin girls. Police have identified the suspects as John Herman Carder, aged 76, from Virginia, and Jim Dean Syfert, 52, from Illinois. Also arrested in a raid at 8.30pm yesterday (Monday, October 29) was Frailline Mae Sagabala, aged 19, who was described Syfert’s live-in partner. The three remain in custody while the girls have been handed over to the local Municipal Social Welfare and Development Office. 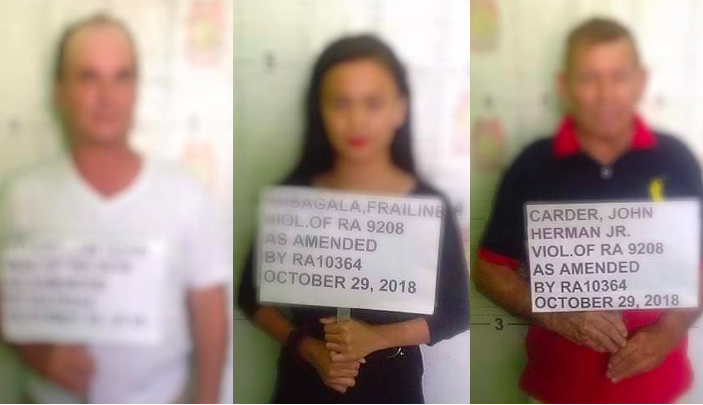 The girls told the police that they had been given two cellphones, 500 pesos to buy clothes, scholarship grants and the installation of electricity in their home if they agreed to work for them. The police report also alleges that when the raiding party entered the house they found one of the male suspects “scantily clad in an underwear while facing the minors”. It also said that they were “surprised to see the minors drinking hard liquor with the two foreign nationals”. The raid followed a tip-off from a “concerned citizen” about the presence of the 14-year-old twin girls and was accompanied by the owner of the rented house in Barangay Santa Lucia. It is likely they will be charged under Republic Act 9208, or The Anti-Trafficking in Persons Act of 2003. However, failing this, and even if there is no evidence of sexual abuse, they could still face charges under Republic Act 7610. A provision in RA 7610, or the Special Protection of Children Against Abuse, Exploitation and Discrimination, prohibits adults from being in the company of any minor who is not a relation. The law states that it is illegal for “any person who shall keep or have in his company a minor, 12 years or younger or who is 10 years or more his junior in any public or private place, hotel, motel, beer joint, discotheque, cabaret, pension house, sauna or massage parlor, beach and/or other tourist resort or similar place unless there are family ties or some other legal bond or obligation involved”. The law is regularly used against foreigners when there is no direct evidence of sexual abuse having occurred. Last December 26, for example, Belgian Koen Van Den Broek was arrested at Cebu’s South Bus Terminal. He was in the company of a 13-year-old girl, her nine-year-old brother, a three-year-old girl, her four-year-old brother and two aunts aged 18 and 19. The group were about to depart for a family vacation in Moalboal, and were due to be joined by a mother of some of the children en route. Despite the family assuring police that Mr Van Den Broek was just a family friend, he was charged under the act. Eventually, in July, the charges against him were thrown out of court.